Can I Give My Dog Honeydew? Getting our fruits and vegetables is far more enjoyable when we can make it fun, and one of the best ways to jazz up a fruit platter is to incorporate all the colors of the rainbow. Melons like cantaloupe and honeydew are great for buffet table fruit trays and summer barbeque fruit salads—they’re easy to prepare, sweet and mild in flavor, and relatively mess-free. And, since honeydew is full of water, natural sugars, and energy-boosting vitamins and minerals, it can be a refreshing break from heavier or spicier foods. Whether you like honeydew on party platters or as part of your everyday routine, you probably consume it at least semi-regularly. Because honeydew is mild and universally liked, it seems like a great option for your begging pooch. But educated pet owners have learned to be wary of fruits—after all, grapes and raisins are toxic, so it’s very possible that melons may be, too. So, is this food canine-friendly? 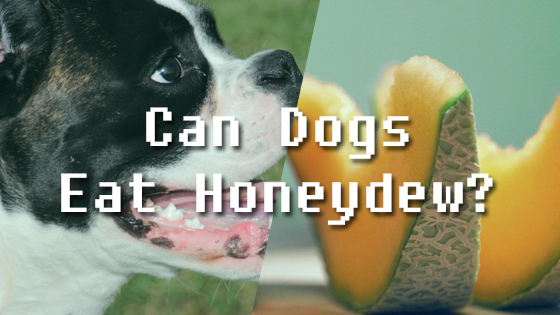 Can dogs have honeydew? Yes! Fortunately, dogs can eat honeydew in moderation, so if you’re looking for a way to let your dog enjoy a taste of summery fruit, this is a great option. 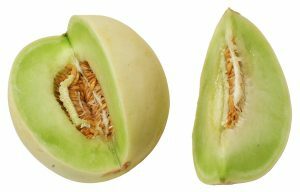 Honeydew flesh does not contain anything that could be poisonous to dogs, so even if they gobble up quite a bit, there should not be any lasting damage. This fruit is high in vitamins, minerals, and water. It is usually easily digested, and it may offer some small health benefits for your canine companion. There are a handful of ways that honeydew may benefit your dog’s health in the long term. One of this fruit’s biggest assets is its high water and fiber content. Though very large amounts of concentrated fiber can cause problems with your dog’s stomach if they do not drink enough fluid, this watery fruit is perfect for treating constipation and helping with digestion. While your dog probably should not load up on bran flakes, prunes, and raw cabbage, moderate amounts of fiber can have powerful health benefits. This food’s high water-to-fiber ratio is perfect for relieving mild constipation in dogs. Fiber helps speed the passage of waste through the intestines in two ways. Firstly, it adds bulk to stool, which helps stimulate digestion. Secondly, fiber becomes slippery and gelatinous when it soaks up water. This makes it an excellent way to bring fluid into the intestinal tract, which will make stool softer and easier to pass. If your dog has problems staying regular, adding watery produce like melons and cucumbers to their diet may be a great way to get things flowing smoothly again. Fiber is great for weight management, too, which is noteworthy in a time when over half of our dogs are overweight or obese. Pudgy pups may be adorable, but they are also far more likely to develop a variety of chronic and potentially life-threatening diseases, so it is in their best interest that we monitor their wait. An excellent way to keep their weight in check is to ensure that their diet is supplemented with foods that contain moderate amounts of fiber. Though dietary fiber is very healthy, it does not actually help our dogs meet their nutritional needs—fiber is the stuff in plants that they can’t digest, so it contributes neither energy nor nutrients. Since dogs can’t digest it, they can’t get any calories from it. This means that, for Fido, fiber is a zero-calorie food. Because honeydew is mostly fiber and water, a whole cup of it is only around 60 calories. This means that your dog can fill up their stomach on this high-volume food while taking in only a few calories. By eating high fiber fruits, your dog can enjoy a full tummy and stick to a calorie restricted diet at the same time. Honeydew is also high in potassium, several vitamins, and many antioxidants, which can fight inflammation, protect body cells against free radicals, and boost the immune system. Antioxidants protect your dog’s health by destroying the free radicals that are thought to cause the cell damage that results in diseases like cancer and osteoarthritis. There is even some evidence that antioxidant-rich foods can reduce inflammation associated with arthritis, effectively alleviating pain and improving joint mobility. The downside to honeydew: if given in excess, it is likely to cause diarrhea. In addition, all melon given to dogs should have the peel and seeds removed, because these can cause intestinal blockages that may be life-threatening. You also should not give your dog honeydew in milkshakes, yogurts, or other sweetened desserts. Melon balls or cubes are good enough. In conclusion, honeydew is an excellent treat option for your dog. It is high in water and fiber, which can regulate digestion. It also contains high amounts of certain vitamins, minerals, and antioxidants that can slow the aging process, protect against disease, and reduce symptoms of inflammatory illnesses. Just remember to practice moderation—too much fruit will give your dog diarrhea. Can Dogs Eat Corn? Can Dogs Eat Chickpeas?